Elegant and modern fonts are popular among web designers. They’re often used for logos, images, and headers. Many elegant fonts mimic letters drawn with other materials such as markers, pens, pencils, and brushes. They are, quite simply, artistic. They also mimic another artistic means of writing: handwriting. Handwritten scripts are great choices because there’s no real limit to the number of them you can use. There are enough different styles of handwriting that’s it still easy enough to find something unique. When we’re looking for elegant modern fonts, we’re not limited to just clean and readable typefaces. In other words, we can use fonts that are elegant and stylish if we use them correctly. In general, I recommend using highly legible fonts for the body and save the scripts and hand-drawn fonts for the headers and logos. I don’t recommend going so fancy that someone has to stare at the words for a while to figure out what they say. The more elegant fonts connect the letters to each other to create words. They can sometimes be difficult to read, but they’re great for short words and phrases. It also depends on how and where the fonts are used. Fonts in headers and logos can be more edgy and artsy than fonts in the body because the body text will be read for extended periods of time. It’s the artsy and edgy fonts that stand out. These are the fonts that can help visualize your brand, making it recognizable. These are the fonts that are the most elegant. I’ve chosen fonts based on modern needs with typography trends in mind: hand-drawn, script, geometric, serif, slab serif, etc. Not all of these fonts are suitable for all uses. Where I felt that it was needed, I provided information about where the fonts could be used. I’ve included a few simpler fonts that can be used anywhere and are great for extended reading. Most of these fonts are complex, but I feel they are still readable. Some of these include the font family, meaning they include regular, bold, italic, medium, light, etc. I’ve indicated what’s included for the purchase price for your convenience. Annabel Script is a hand-written typeface in cursive script. It includes a basic glyph set with upper case, lower case, numbers, symbols, and punctuation. It’s clean and easy to read and is a great font to have a romantic look for headers. It includes OTF files and costs $9 for a single user to create unlimited products. 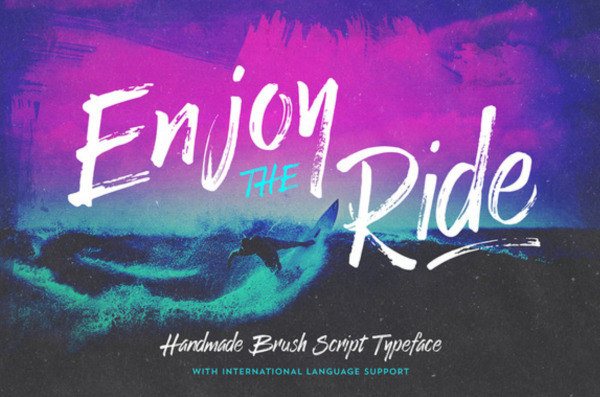 Enjoy the Ride is from Ian Bernard of Vintage Design Co. It’s a hand-drawn typeface that looks like it was written with a brush. It includes upper case, lower case, numbers, symbols, and punctuation. It also includes 26 swatches, alternative characters, contextual alternatives, and language support. It’s an excellent design for logos. The standard license is $16 and the extended license is $30. 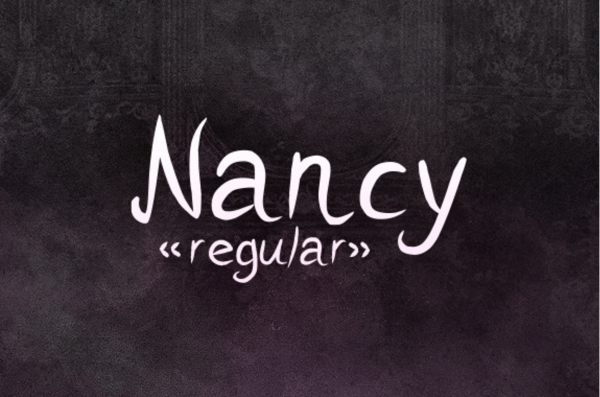 Nancy regular is a simplified hand-written script font that matches well with other fonts for websites with illustrations, anything geared toward children, etc. It includes upper case, lower case, numbers, symbols, and punctuation. It includes TTF and SCG files. It costs $4.00 for a standard license and $40 for the extended license. 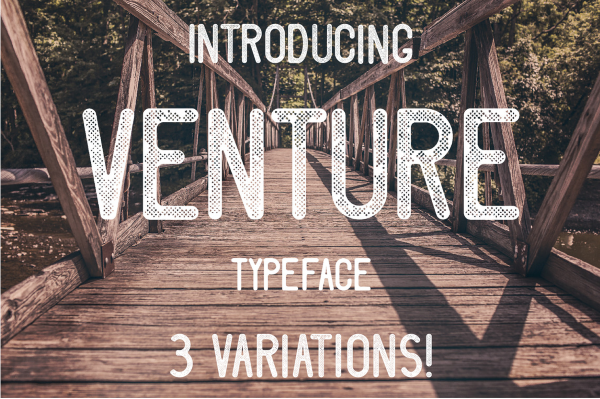 Venture is an all-caps font with three different style variations which include the standard look, eroded look, and a printed look. It includes upper case, numbers, and symbols. It includes OTF and Adobe Illustrator files. The standard license is $8 and the extended license is $25. It works well for headers and logos, and is a great typeface if you want a vintage or old-style printed look. 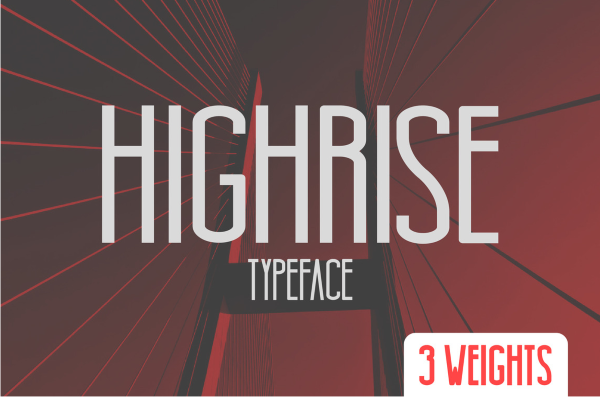 Highrise is a sans serif typeface with a tall architectural style. It has three different weights (light, regular, and bold) and includes upper case, lower case, numbers, and symbols. It looks great in logos, headers, etc. It include OTF and TTF files. The standard license is $8 and the extended license is $25. 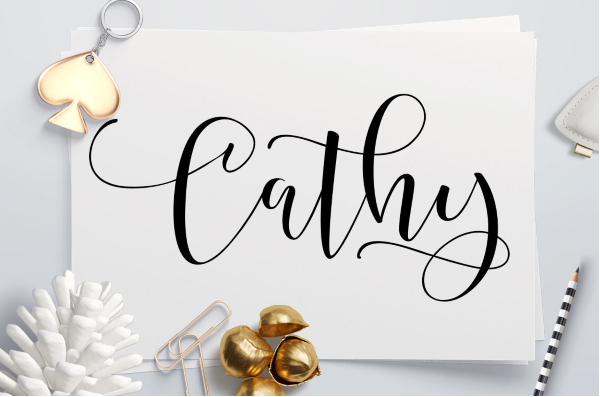 Cathy is a hand-written script font that looks like fancy cursive. It has a lot of glyphs, initial and terminal letters, ligatures, and alternate fonts. Too much of it can be difficult to read, but used correctly it can make your titles, logos, banners, and headers stand out. It includes upper and lower case and is a perfect choice for wedding websites. TTF and OTF files are included. The standard license is $15 and the extended license is $150. 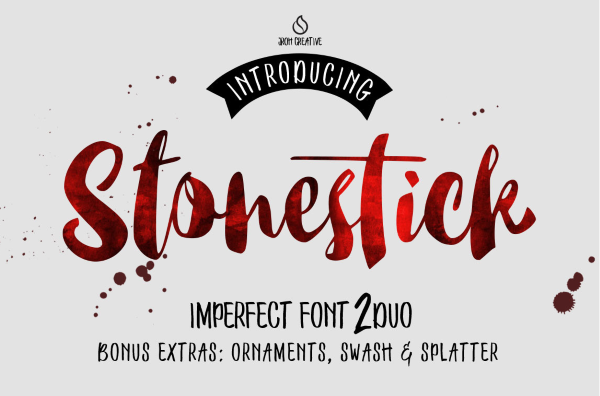 Stonestick is a collection of fonts with several styles such as an imperfect brush, bold, solid, and smooth. It includes caps, upper case, lower case, numbers, symbols, punctuation, alternative characters, and it even includes some extras: swash, splatter, and ornaments. It’s perfect for logos, headers, and more. It comes with TTF and OTF files. The standard license is $16 and the extended license is $75. Pastis is an all-caps font that uses different glyphs for upper and lower case. The family includes both regular and italic. It reminds me of the typeface you would expect to see in a French restaurant. It’s a great choice for restaurant websites, logos, headers, and more. It costs $25 for the family or $15 each to buy the regular and italic fonts individually. Hey Cutie! is a hand-drawn font that was inspired by the handwriting in school notebooks. It’s simple and makes it a great choice for any website geared toward teens, girls, or even something to inspire sweetness such as bakeries. It includes lower case letter, numbers, and symbols. TTF and OTF files are included. The price is $10 for a single user to create unlimited products. Maker Doodles is a hand-drawn typeface that was inspired by a chiseled-tip marker. The style lends itself well to websites for kids. It’s a good choice for headers. It includes upper case, lower case, punctuation, and numbers. It includes TTF and OTF files and it costs $10 for a single user to create unlimited products. 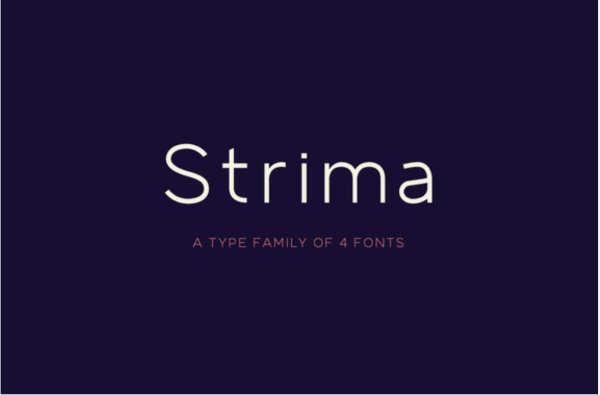 The Strima family includes four fonts: Light, Book, Medium, and Bold. It’s a geometric sans serif that’s minimal and highly readable. It has over 1000 glyphs and has a full set of professional typographical features. The package includes OTF files and it works well for any need including body text. The standard license is $89 and the extended license is $200. 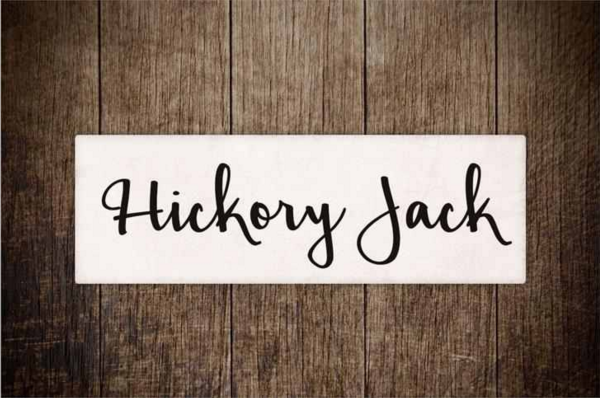 Hickory Jack is a weighted script that’s easy to read. It includes upper case, lower case, numbers, and symbols. It also includes lots of accents. It’s a good choice for headlines and logos. It includes regular and light fonts in TTF format. Using it for commercial purposes requires a business license, which starts at $5. 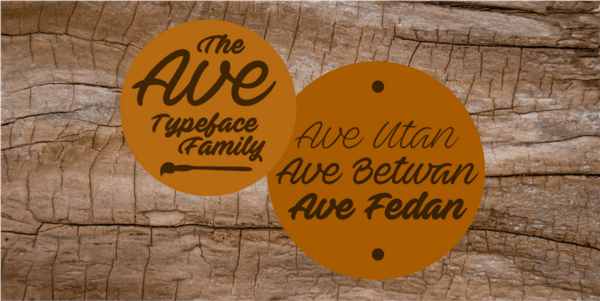 The Ave family is a flowing script that consists of thin, medium, and bold typefaces. It comes with upper case, lower case, punctuation, and uses numbers to create lots of swashes and textual alternatives. It uses the TTF file format. The commercial license is $59. 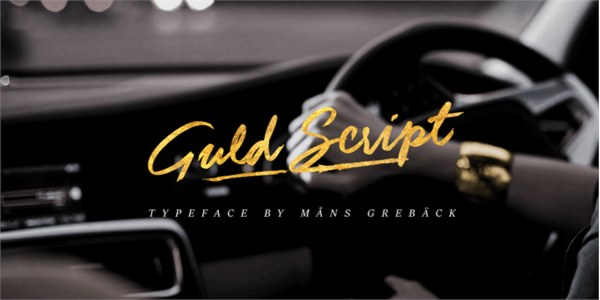 Guld Script is a brush font that uses vibrant strokes to get a slightly sloppy and wet look. It includes upper case, lower case, punctuation, and symbols – 358 characters in all – in TTF format. It’s a beautiful font for headers and logos. The commercial license is $59. 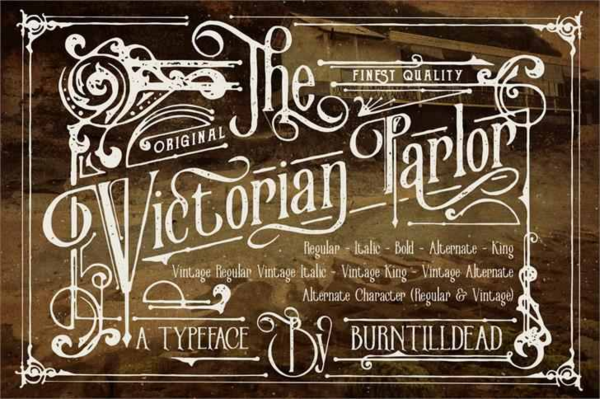 Victorian Parlor if a font family with a Victorian vintage flare. It includes regular, italic, bold, and alternate character sets (in both regular and vintage styles) with upper case, lower case, numbers, and symbols. It’s a good choice for banners, ads, logos, and more. This font is provided in OTF format and is freeware, so there’s no cost for commercial use. In order to use these fonts within WordPress you’ll have to add them. You can do this manually by adding them to your CSS file, but the easiest way to add them is to use a plugin that automates the process for you. Here are a couple of plugins that use TTF and OTF formats and are easy to use. Use Any Font provides an uploader so you can easily upload the fonts, and then it adds them to the list of fonts in your editor. It speeds up font loading time by allowing you to store your fonts on your own server rather than theirs. You can upload the fonts using the uploader, which will automatically perform a conversion if it’s needed (requires API key for conversion). Single activation or conversion of one font is free. Unlimited activation and conversion requires a contribution of at least $10. Fonts is a premium plugin that adds two drop-down menus to your Visual Editor: one for styles and one for sizes. You can add Google and custom fonts. Getting access to the instructions requires a $49.99 per month membership (which includes other benefits from the company). You’ll only need one month unless you want continuing support. Elegant and modern fonts are great for making websites stand out and adding a higher sense of style and flare. They’re great for logos, banners, ads, headers, title images, labels, and more. Basically, any place that could use some textual personality. Make sure to check the licensing agreement to verify the font can be used the way you intend. Your turn! What kind of fonts do you find yourself needing most often? How do you use custom fonts with Divi? If I install the font plugin, will the fonts be available in the drop down don’t selectors for my modules? I think you need custom CSS… My web developer did it for my website recently. But he charged me to do it. I can give you his name if you’d like. Let me know. Lovely selection – bar ‘Nancy’ – hope I never open a page to see that face 🙁 with ‘Marker Doodles’ a close run second! Great fonts Randy. Except nancy, which is basically comic sans on crack. Thanks for writing about elegant & modern fonts and its different uses. Really, it is a great font for making websites. Those fonts make the websites, logos & banners more beautiful & attractive. Burnt Till Dead?? (creator of the Victorian font) Scary. Great list ! all themes are good but I like Divi theme the most ! Easy custom and adjust ! How to install professionall web fonts (linotype or adobe typekit for example) for using with Divi modules / settings / slider / pagebuilder? An easy and fast way to install professionell corporate fonts for our customers would be a great feature for Divi. Unfortunately, most such fonts don’t work for most languages other than English. A single unsupported character can break an otherwise perfect font. It would be nice to have a little quick guide on how to add fonts without plugins. Shouldn’t be too difficult I think/hope, and you’ll avoid installing (and mantaining) hundreds of plugins for everything. Great of all fonts use. Nice post!!!! Thanks for the your advise for web design font. Thanks for sharing beautiful fonts for website. This will really help for the designing of my website. Keep the great work. Randy, I have been using fonts from fonts dot com for my clients, however in the recent times I’ve started using Google Fonts more, it has good collection of Fonts and they give font effects too. How can know which fonts support Turkish characters and which don’t?